As a successful agent, you already know your farm when it comes to conventional listings. With a little work you can extend that expertise to the foreclosure market and expand the opportunities in your farm. To position yourself as a foreclosure expert, you must first gain market knowledge and then use that knowledge to demonstrate your expertise. The first step is to understand the foreclosure process in general and the foreclosure laws in your state specifically. See the Foreclosure 101 Guide to get a high-level understanding of the foreclosure process. Armed with that knowledge, you’re in a position to demonstrate your expertise. For example, you can offer seminars in your farm area on alternatives to foreclosure or partner with a CPA and attorney to offer short sale education. But knowing the laws and process is only the beginning. You also need to know about the foreclosure activity in your local market at all stages of foreclosure – properties in default, properties scheduled for auction, and what happened to the properties sold at auction. You need the kind of information you typically get from the MLS on traditional sales, but most foreclosures are not listed in the MLS. You’ll have to develop alternate channels for staying current on this information. Once you have the information, there are many ways to establish your expertise in your market. 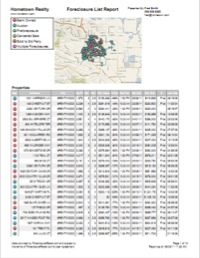 One way is generating lists and reports that help your clients understand the market trends that affect them and see the current activity in their own neighborhoods. 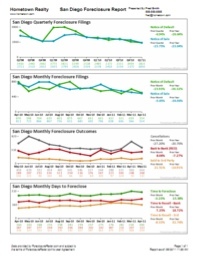 A foreclosure activity report is a list of properties in one or more stages of foreclosure. It can be tailored to match your target customers, whether segmented by location, price range, size, amenities, or other criteria. A simple search can uncover hundreds of properties, in various stages of foreclosure, properties that are probably not in the MLS that can give you a significant competitive edge. Working from an up-to-date list of properties, you and your clients will know about opportunities before the competition does, giving you both an advantage and establishing you as an expert with special knowledge in the view of your customer base. A map overview is an effective eye grabber and conversation starter. 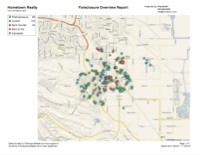 A map with dots representing properties in foreclosure in your area instantly communicates the big picture the way a list of properties in a report never would. Branded with your business information, it can serve as an oversized business card at a showing or open house, or an illustration at club meetings, Chamber of Commerce, HOA and town meetings or other marketing opportunities, such as email campaigns Some people look at the report and realize how bad the foreclosure crisis is in their area while others think that it looks better than they thought. Agents who have used the map overview report that people relate to this report and will say something like “I may be a dot on your map soon.” It’s definitely a highly sought-after differentiator. Statistics revealing market trends are a good avenue for establishing expertise and starting conversations. You’ve probably seen the Foreclosure Trends Reports on PropertyRadar.com. You can create a similar report branded for your business for your local market, establishing yourself as the local foreclosure expert. Design the report to focus on the issues that are most relevant to your clients, such as number of foreclosure filings, bids and outcomes at auction, time to foreclose, or various metrics regarding the properties such as square feet or year built. Combine multiple charts to create a branded report to highlight the compelling issues for your local market.